Many people think of the golden Shachihoko when talking about Nagoya. These mythical creatures are found on the castle tower and are the symbol of Nagoya. Nagoya city, Aichi prefecture, is one of the largest cities in Japan. It is also the biggest city in the Tōkai region, the central portion of Japan. Misokatsu (fried pork cutlet with thick miso sauce) and hitsumabushi are the local specialties in Nagoya that often come up in conversations. Besides food, the Golden Shachihoko (Kin no shachihoko) are another one of the things that Japanese people first think of when talking about this city. But, what exactly are these golden Shachihoko? The secret to it has to do with Nagoya Castle which is the landmark of Nagoya. The Golden shachihoko are placed at both ends of the tallest tower. Why Are There Shachihoko on the Top of the Castle? Nagoya Castle was built by order of Tokugawa Ieyasu, the first shōgun of what became known as the Edo era which lasted for 265 years. It was constructed when he succeeded in unifying the previously scattered and warring states of Japan. Two golden shachihoko (or "golden dolphins" as they are sometimes referred to in English) are located on the castle tower of Nagoya Castle. Shachihoko (shachi) are imaginary creatures with the body of a carp and the head of a lion or tiger. The Japanese character for the word shachi is 鯱 which combines the two characters for 'fish' and 'tiger'. In Japanese mythology, it was believed that if there were a fire, the shachihoko would put it out by bursting out of the water. As a result, statues and illustrations of these creatures are still placed around houses, at temples and castles as guardian deities. 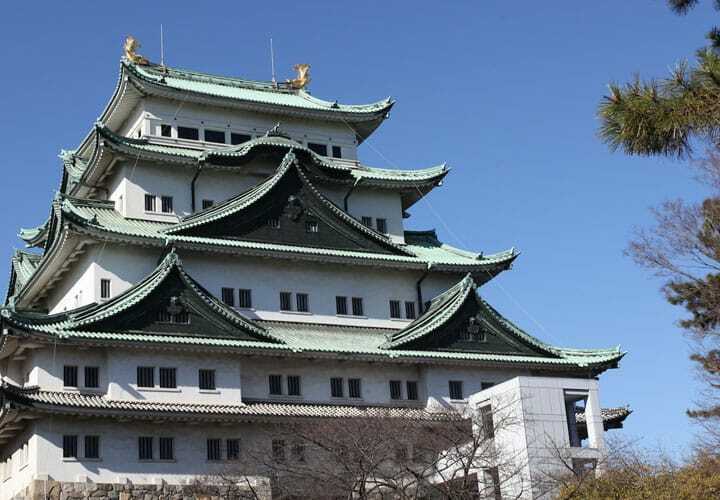 When it was first built, there were many regulations and restrictions on which castles could have golden Shachihoko, which tells us how truly rare the golden Shachihoko of Nagoya Castle are. Now, let's take a look inside the castle tower. The castle tower has seven floors. This photo was taken in the basement area, where you can take a closer look at a scale model of the golden Shachihoko. From the first to the fifth floors there are exhibit rooms where you can see various displays on the history of the castle. There are signs with English translations of the exhibition explanations, so don't worry if you do not understand Japanese. The sixth floor is the machinery room and is off-limits to the public. You can go up from the first floor to the observation room on the seventh floor by the spiral staircase or the elevator. You can see Ninomaru Garden or the city view of Nagoya from the observation room. Honmaru Goten was constructed in 1615 as the residential building for the feudal lords of Owari (former name of the area around Aichi prefecture). It was called the best modern castle residence, and was designated a national treasure. However, the original building was lost in the Allied bombings of the Second World War. As of January 2016, reconstruction of this national treasure is underway with the buildings set to be fully completed by 2018. Only the entrance and the Omote Shoin are opened to guests now. This is the interior of the Omote Shoin, or main hall. Almost everywhere you look, from the walls to the fusuma (*1), everything has been decorated with gold leaf, making it a truly captivating sight. The sight of these decorations and the utter silence of this hall add a greater air of solemnity to the room which in turn has a profound effect upon its visitors. *1: Fusuma: the sliding doors that separate rooms in traditional Japanese houses; these are made by layering paper over a wooden frame. Within Nagoya Castle, there are large buildings beside the tower, such as the towers Tōnan Sumiyagura, Seinan Sumiyagura and Seihoku Sumiyagura, all three of which are designated important national properties. Although not gold, there are also shachi at the top of these three guard towers. The bright white external walls of these structures look refreshing. This is Ninomaru Garden, located within the castle grounds. You can enjoy matcha (green tea) in the tea room there. When traveling in central Japan, please check out the actual golden shachihoko of Nagoya Castle with your own eyes!